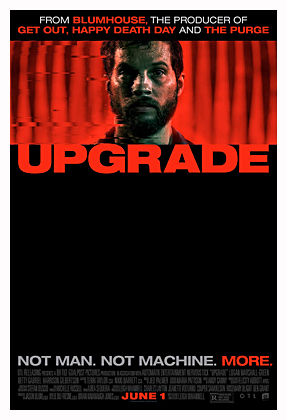 Set in the near future, Upgrade tells the story of vintage car restorer Grey Trace (Logan Marshall-Green), who on the way home from delivering a car to a client with his wife Asha, (Melanie Vallejo) is ambushed by a group of men. They kill Asha and turn Grey into a paraplegic. Paralyzed from the neck down, Grey’s client, billionaire genius Eron Keen (Harrison Gilbertson) offers him a chance at being able to function again. A micro computer called STEM (voiced by Simon Maiden) will be inserted in his spine to bridge the gap between his body and mind. STEM, however, is not just a computer but an A.I. that co-exists with Grey. Now with STEM operating in his head and enhancing his physical abilities, the A.I. begins to help Grey track down those who murdered his wife and make them pay. Fun 80s style action flick is written and directed by Leigh Whannell, who wrote the first three Saw films, all the Insidious flicks and directed Insidious: Chapter 3. It tells of a future where humans can be enhanced by computers and internal parts, such as the thugs who killed Grey’s wife having their guns built inside their arms. Now enhanced with STEM, mild-mannered Grey can fight like a trained soldier and move like a martial artist. He can also kill with lethal efficiency. It’s an entertaining good time to watch him track down those responsible, all the while being pursued by a cop (Betty Gabriel) who is trying to figure out how a paraplegic is killing the thugs in question one by one. While the film can get silly at times, a bar scene stands out as an example, it’s mostly a fun time well directed and cleverly presented by Whannell, with some intense action and chase sequences and horror movie level gore. On a technical level Whannell accomplishes a lot on his modest budget. The film looks great and has an awesome 80s vibe with colorful cinematography by Stefan Duscio and Jed Palmer’s very 80s electronic score. A fun homage, yet also very contemporary with it’s portrayal of the gap between man and technology becoming smaller and smaller. The cast are solid. Logan Marshall-Green is convincing as a guy-next-door who becomes a detective and a skilled killer basically overnight. He is fun to watch as he tries to deal with having another intelligence in his head and abilities he’s never had before, not to mention a peaceful man now killing for revenge. He’s very well cast. Simon Maiden is effective as the voice of STEM, who only Grey can hear. He gives the A.I. character. Harrison Gilbertson portrays well the recluse billionaire who is barely out of his teens. He captures the solitude and awkwardness of being a unique individual very effectively. Betty Gabriel is good as Cortez, a cop trying to figure out how these thugs are being murdered when her only suspect is in a wheelchair. Rounding out the leads is Benedict Hardie playing Fisk. He’s basically the lead thug, a former military man now with computer enhancements to make him even more lethal and an equal opponent to the upgraded Grey. It was refreshing that he wasn’t played as a paramilitary tough guy, but almost a nerd that was now equipt to kill and enjoying it. While her screen time is limited, Melanie Vallejo made an impression as Asha and she and Logan Marshall-Green had nice chemistry, so their relationship was believable and the effect of her demise strongly felt. Overall, this was a fun and clever action movie with a delightfully 80s vibe. Whannell directs well from his own inventive script and accomplishes a lot without a big budget. He has a good cast and if the film has any flaws, it’s that occasionally it veers into silly territory and the end reveal wasn’t that hard to see coming. The action is well choreographed and there is some graphic violence which fits in with it’s 80s feel. A very entertaining and sometimes inventive little movie that works as both 80s homage and contemporary sci-fi thriller.